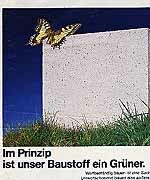 The few examples learn how in many cases advertising tries to attach some green value to the product or service. The examples prove that the green in many cases is nothing more than a façade. The examples also reveal how this leads to a frustrating contradiction. The green actors often are the first victims of the consumption instigated by their courteous cooperation. I happily drop into the service station to fuel, after I learned that super-tankers protect the blue whale. Super-tankers may exceptionally spill a few drops. They may in some rare case of force majeure rinse their tanks whilst at sea. But in general: the more I burn, the more they bring, the cleaner the sea. 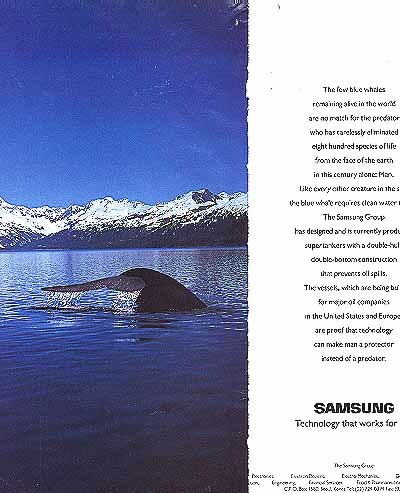 The introduction to the ad (right) is well done. I pay with a green credit card: it helps protecting the rain forest. I sometimes buy some drink-boxes extra at the fuel station in order to reach the minimum amount to qualify. 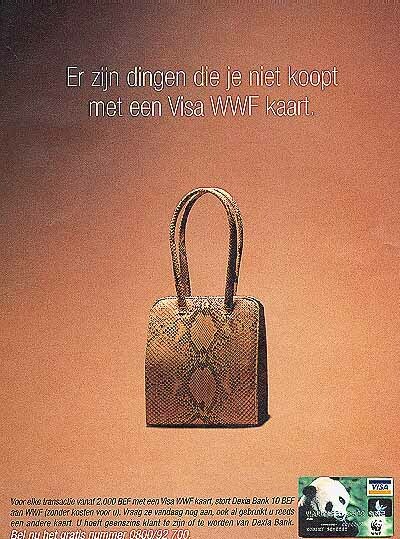 The ad - trying to be witty - says (translated from Dutch): Some things you don't buy with a Visa WWF card. ... For each transaction of more than 2000 BEF, 10 BEF will be donated to WWF. I pay 350 BEF for the card (price at time of introduction). Then only transactions of at least 2000 BEF (about 50 Euro) qualify. The amount donated (always 10 BEF) is not connected with the amount of the transaction. Meaning that my donation will reach 350 BEF (cost of the card) only after 35 qualifying transactions. Conclusion: an effort of 70350 BEF to donate a meagre 350 BEF! The system whips up consumption. Nothing guarantees that people will only buy green things with their card. Reparing the damage will surely cost more than the action yields. 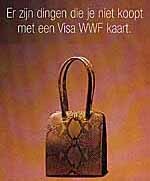 It is much better for the environment (WWF should know that) if people donate 350 BEF directly short-circuiting the card-construction. It would cost less and it wouldn't cause nasty side-effects. My holiday residence (in a forest clearing, very cosy, lovely people all around; the access-road needs improvement though) is build with green bricks. 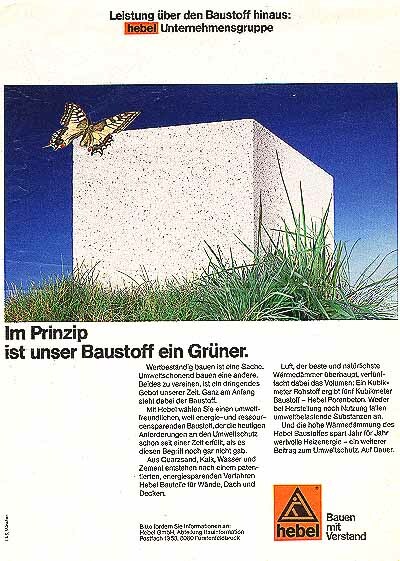 The ad then explains how, since long, the environment-friendly, energy and resource saving product is made from quartz-sand, lime, water and cement and never causes any pollution. It's good to use green materials for building. But I wonder if caterpillars consider green bricks more edible than other ones. Or would the use of green bricks have made any difference to the landscape of [Illustration 1]? 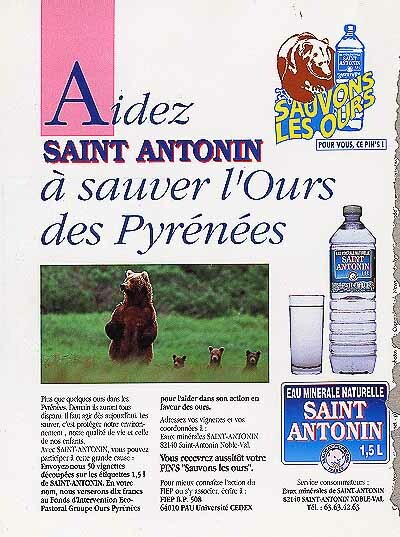 I drink lots of mineral water to save the Pyrenean Bear. Those huge plastic bottles are handy. I use them shredded to fill the pits in the road. This ad is about as sincerely green as a cache-sexe a winter-coat. The chances of an actual donation to be made are rather low. Should they honestly care the company would have donated a small amount for each bottle sold. And they could drop the plastic for glass.